Puma, Mountain Lion and Ghost Cat are just a couple of names for the cougar. Cougar. Catamount. Painter. Panther. Ghost Cat. Puma. Shadow Cat. Mountain lion. The etymological history of the word cougar comes from French naturalist-explorer Count Georges-Louis Leclerc Buffon, who called Puma concolor“cuougar”. This usage was derived from the Brazilian Portuguese word cuguacuarana, which in turn came from the Tupi Indian word susuarana, which means “false deer”. We find that this word aptly captures the international allure and cross-cultural nature of the species. Cougars living in the area surrounding Lake Eire were given the name Erielhonan, meaning “long tail” by the Native Americans living there who shared their identity with the Cat calling themselves The Erie or Cat Nation. In 1600, some 14,000 Eries lived in villages between what is now Buffalo, NY and Sandusky, Ohio. In 1656, the Erie were almost exterminated by the Iroquois League. The surviving captives were either adopted or enslaved. The spirit of the Cougar has chosen to take the earth and walk as a spiritual hunter, to teach unconditional leadership, patience, and determination. According to animal totem lore, the cougar contains the energy of leadership and is graceful, balances intention, strength, and responsibility. If we listen to the cougar we learn to become the leader that people follow by choice, not by force. A cougar has the wisdom to lead through love, not through fear. Those who have cougar energy are people that are natural leaders. If no one else is leading, a cougar personality will naturally take over. Others are always safe when cougars are in charge. The cougar is very elusive and is rarely encountered in the wild. 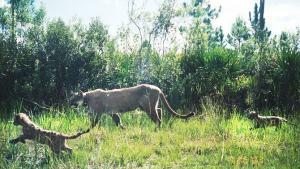 Because of this quality, a cougar can appear without being noticed and quietly take control of a situation. Sometimes this can lead to conflict with others over territory. It is often noted as an animal that is independent, shy, and withdrawn. The same characteristics are often found in people with this medicine. The cougar is associated with leadership and can teach us about decisiveness in the use of personal power. 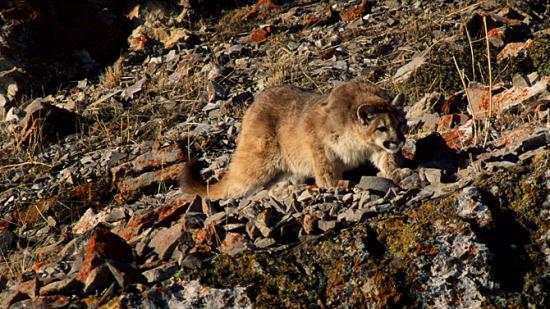 When a cougar attacks it does not hesitate and when threatened it goes for the most vulnerable place. Like many leaders a cougar does not often show vulnerability. True leadership through gentle assertiveness is what cougar teaches those with this totem. Cougar people are often very sure of themselves and do not take any unnecessary steps or exert any extra energy beyond what is required of them to achieve their goals. Most cougars learn by trial and error, which strengthens them and hones their skills. In life, cougar people may find that others will not like these assertions. Cougar people mustn’t allow others to keep them stationary—cougar people stretch their muscles and show their capabilities. Those with the cougar medicine are often attacked by others, especially by those who have grown comfortable with the status quo and do not wish to see those who have this totem grow. Even still, they may never admit when a cougar person does grow. A cougar will leap at opportunities. Those with cougar medicine take control of their life and circumstances most effectively.